Or dimly lit corner of the nursery of my own, anyway. Viking machine + Horn cabinet + IKEA chair found in basement trash room. OK, I hate you. Or envy you, anyway. But not as much as I used to, because I FINALLY have a permanent spot for the sewing machine. No more hiding my beloved Viking Platinum 730 in a corner cabinet under a pile of breast-pump paraphernalia! No more lifting stacks of this and piles of that and clearing off the dining table before I can sew a single seam. OK, so my serger is still on a closet shelf and I still cut fabric on a cardboard mat on the bed, but... baby steps! Patchwork baby quilt by my amazing mom, knitted purple diaper soaker by yours truly, and drool by Miss Baby Z. So yeah, more posts and actual finished sewn objects for you soon! How about you? Do you have a drool-worthy permanent sewing setup... or do you have to tug your machine out of the bottom of a closet out from under a pile of old shoes and heave it onto a coffee table every time you get stitchy? P.S. Apologies for dim lighting, but there's so few hours of daylight for blog photos in the dead of winter! P.P.S. OK, I replaced the dimly lit photo with a better shot and added a few more details. Congratz on the sewing station (and the back wrap---so much handier)! I technically have a sewing room but it has no furniture except the ironing board. We have an L-shaped computer desk, so earlier this fall I cleared off one side of the L and made that into the sewing-machine station. Not as cool as yours, however! (Sorry, was typing too fast earlier!) -- meant to say, looks great, and what's the neat organizer-y looking thing on the front of your desk? Oh, it's not an organizer, it's part of the sewing cabinet. It's the Horn 2136 in white--it opens up with all those neat compartments that I keep my main notions in: needles, thread, rotary cutters, presser feet, chalk, measuring tape, etc. And it closes up to a tiny little cabinet. 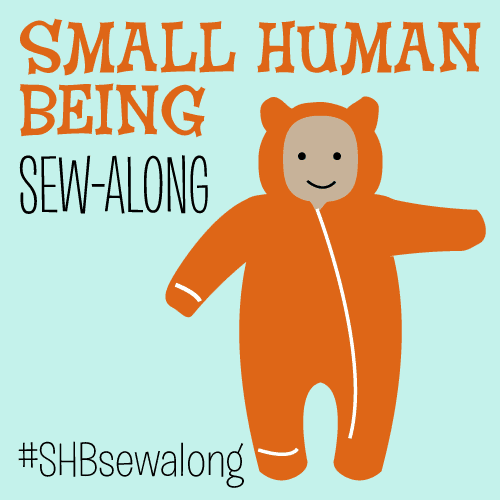 I got it at Sew Right in Queens when I bought my machine. LOVE it. I feel your pain about the lack of a permanent sewing space. I have to drag my machine from the bottom of the closet out to the kitchen table to sew, but hopefully that will change soon. We just moved into a slightly bigger place and decided that our baby (who will be arriving any day now) doesn't need privacy yet, so we are using the extra bedroom as an office/guest room where I can hopefully set up my own sewing corner. That's basically what we're doing, Lisa--the "nursery" is actually where my parents stay (my mom watches the baby while I'm at work), and the baby sleeps in our room. What kind of wrap is that? It's a Vatanai Orkney (I think?) size 6 woven wrap, borrowed from a friend. I only own one wrap, a Girasol Tropical Sea in size 6. 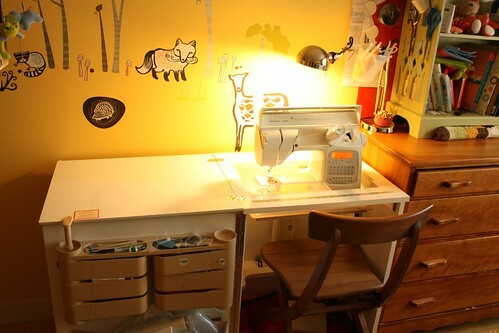 Yay, a space to sew! It makes such a difference when you don't have to set up and break down your sewing machine every time creativity strikes!